Notice a theme with our family costumes this year? Yep we all got to be super heroes. 🙂 I was so happy we had a party to attend this year, and so I finally had an excuse to get us all in costume. The boys got to pick their characters first and then Ian and I picked from the rest of the Justice League options…with Ian as Superman and me as Wonder Woman. 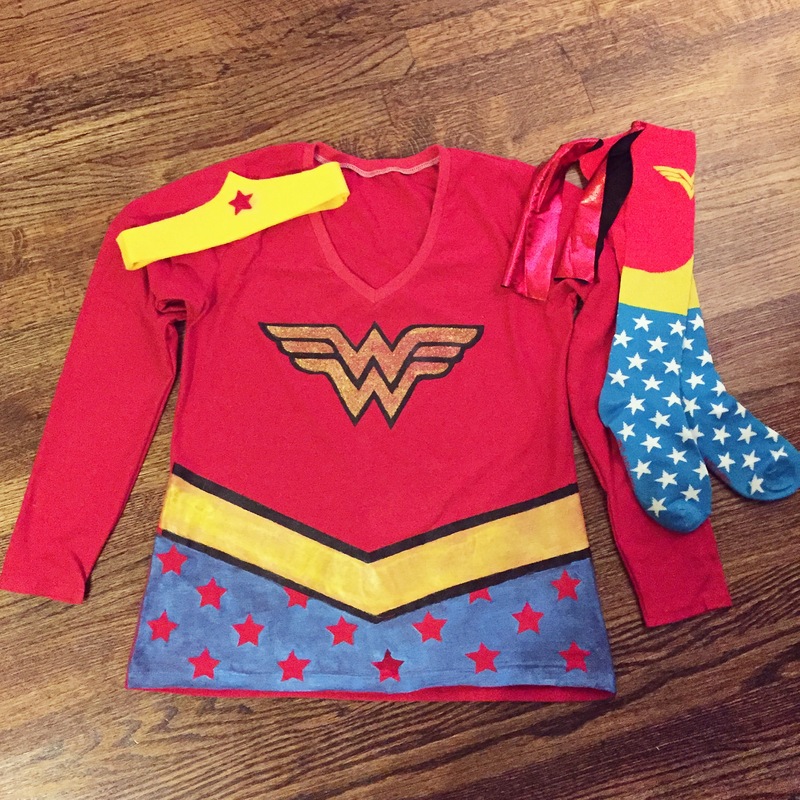 Now this was a family friendly party so no crazy costume for me… 😉 So I did a lot of research on how to keep the WW vibe without showing off a ton of skin. 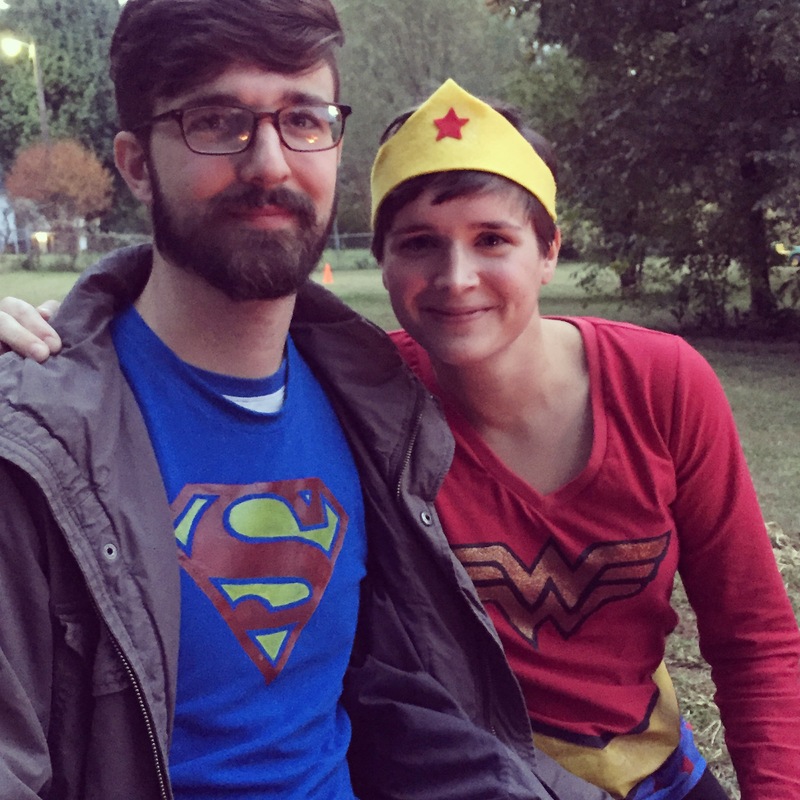 I don’t have any great pictures of the adult costumes from our party but here’s a few Instagram and iPhone pics for ya. Ian’s shirt is the Oliver+S metro tee. I bought the metro tee bundle a while back but hadn’t gotten around to sewing it yet. So this was my first time making it, and I was very happy with the great fit. I used the size S and added about 1/2″ to the shirt and sleeve length. 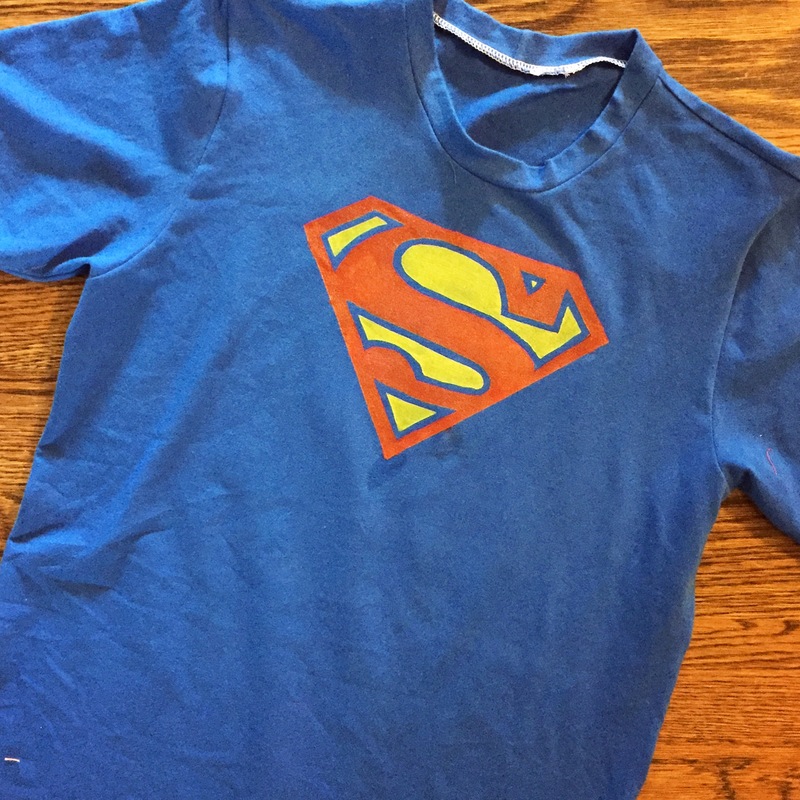 I printed off a superman template and then freezer paper stenciled the logo to the shirt. I had planned to make him a cape and some other costume additions but ran out of time and he was happier with just the t-shirt so I called it good there. My shirt is the Union St Tee from Hey June Handmade- size M in the v neck and long sleeve option. I raised the neckline about an inch and thinned out the neckline binding by 3/8″. This shirt has lots of freezer paper stenciling! I don’t know if that was the best way to go about it but it seemed the easiest so I went with it. Once I was done with it, I kinda wished I had just made a separate belt and then a little skirt to go with the outfit because I loved the tee with just the sparkly gold W and I think I would have gotten a lot more after-Halloween wear out of it that way…but live and learn. And these Union St Tees are pretty easy to make so I can always make another one with just the WW logo if I want to. Oh and both tees are made with Laguna Jersey knits- what else did you expect? lol. I found these great socks on Amazon– with little capes on them and Primed them right to myself on Thursday night! Seriously, way too cute. I finished off my costume with a felt tiara (printable here). Oliver was really disappointed that I didn’t have the arm bands and the lasso but one only has so much time to invest in costumes and this was as much as I had time to get done. 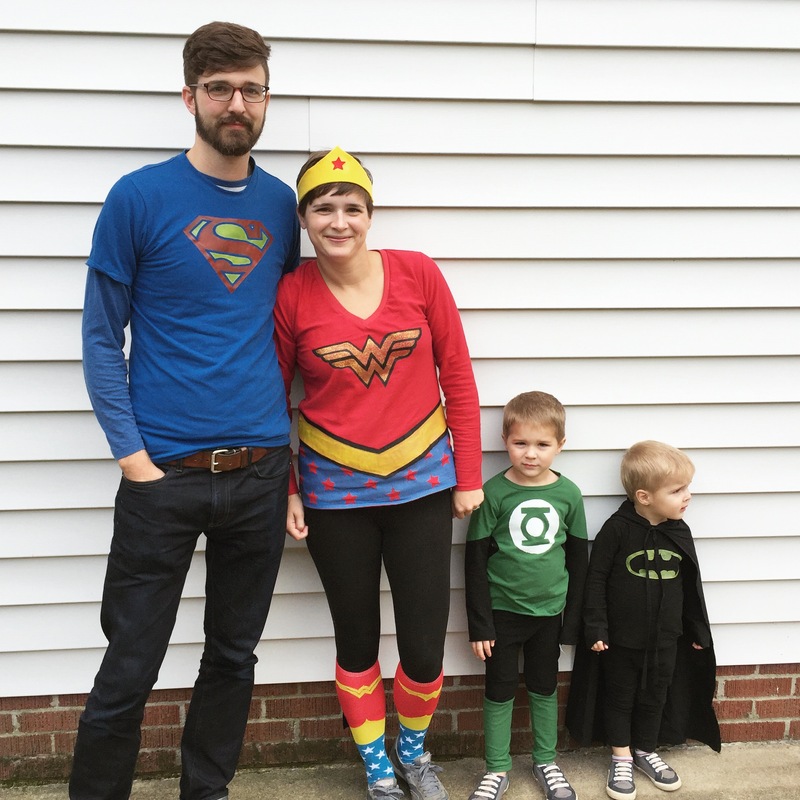 I’m pretty happy with how it all turned out and we had a lot of fun being a superhero family for the night. 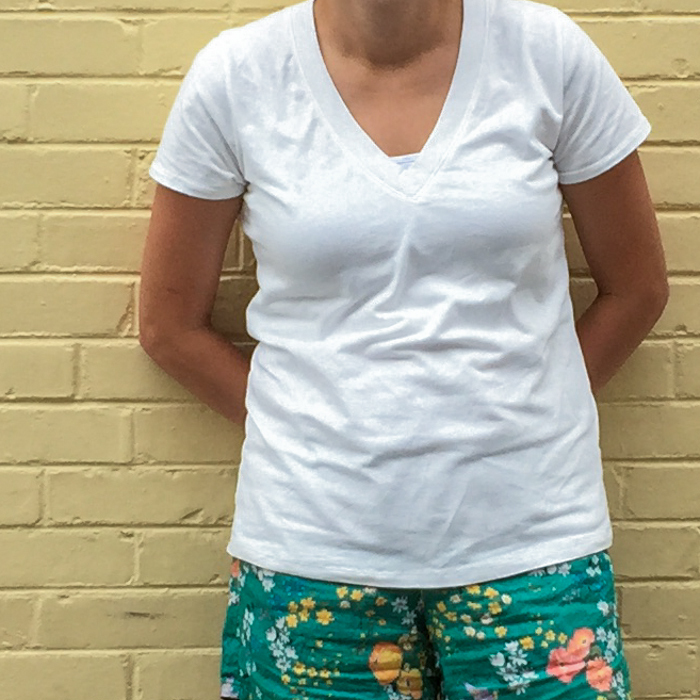 Quick weekend post to show you one of the simplest articles of clothing I have made to date and yet one of the ones I am the most proud of- a white tee shirt! I don’t know about y’all but I have a really hard time finding tees that I like. I have needed a basic white tee for ages and finally just decided to make myself one. And so this doesn’t go the way of many of my other handmades that never get photographed and blogged, I had my husband snap some quick pics on my iPhone while we were downtown this morning. 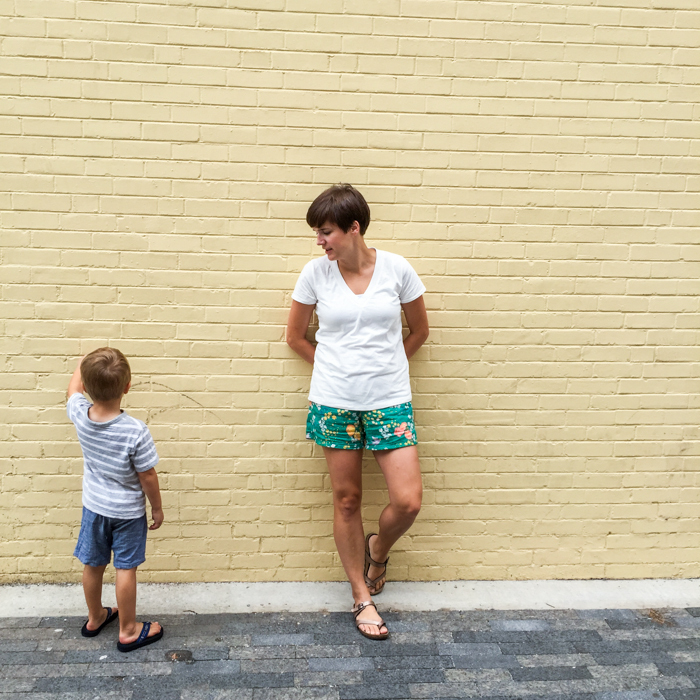 The pattern I used is the Union St. Tee from Hey June. I made the v-neck version of the tee in a size M and it fits perfectly. The v-neck takes some time to construct if you want to do it properly but the end result is very professional. I don’t think anyone can tell it’s not store-bought. Also it feels like a check off the sewing techniques list to learn how to make a proper v-neck binding. Now that I know the pattern fits me well, I have plans to make several more in some fun fabrics! 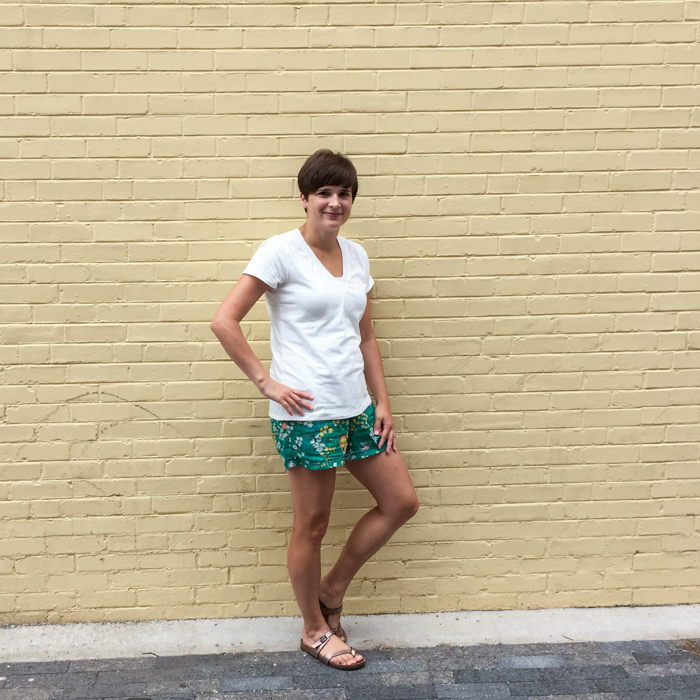 The fabric is Robert Kaufman Laguna jersey knit in white/pdf from Imagine Gnats. You can find the fabric here. I have sung the praises of this laguna jersey before and I say it again, I love to keep this on hand for basic knit needs. The fabric is a great weight and has really good recovery. 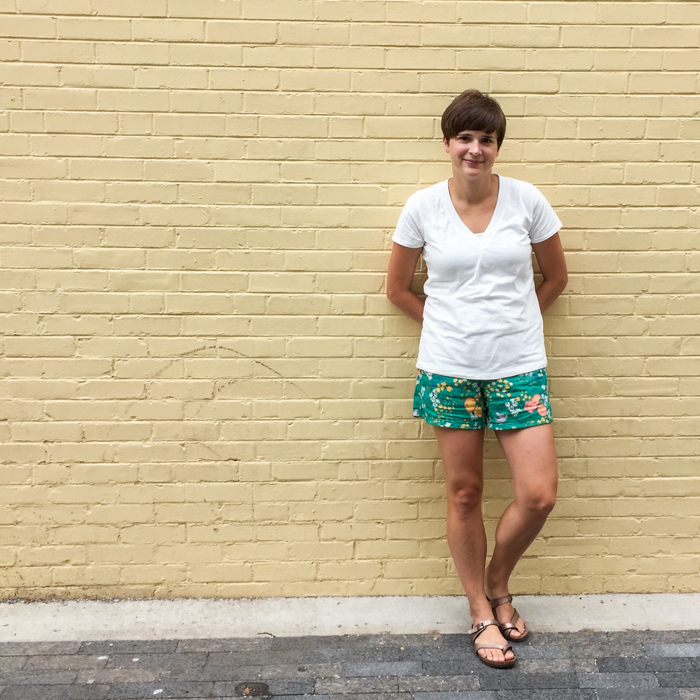 Also one of the best things about this pattern is it can be made with just 1 yard of fabric- making this tee very economical! I doubt I could find a nice white tee for less than $10 at the store. FYI notice, I’m wearing my double gauze shorts (blogged here). So happy to finally have a basic tee to wear with the shorts when I don’t feel like being all dressy with my fancy shirt that matches them. I was pretty pumped to be out in a completely handmade outfit today! Woot, woot!